Whisk or sift dry ingredients in large bowl. In medium bowl cream coconut oil and 1 cup sugar. Soften coconut oil in microwave a few seconds if needed. Mix in molasses. Add egg. Combine wet ingredients with dry ingredients. Chill dough for about 2 hours. Make into walnut sized balls and roll in sugar. Bake 350F for 10-12 minutes. Whisk or sift dry ingredients in large bowl. In medium bowl cream coconut oil and sugar. Soften coconut oil in microwave a few seconds if needed). Add eggs. Add extract, food coloring and coconut milk. Chill dough for about 2 hours. Make into walnut sized balls and roll in sugar. Bake 350F for about 11-13 minutes. Whisk or sift dry ingredients in large bowl. In medium bowl cream coconut oil and 1 1/2 cups sugar. Soften coconut oil in microwave a few seconds if needed. Add eggs. Combine wet ingredients with dry ingredients. Mix cinnamon with remaining sugar in small bowl. Make dough into walnut sized balls and roll in cinnamon/sugar mixture. Bake 400F for 8-10 minutes. Preheat oven to 350F. Line baking sheets with parchment paper and set aside. In a large bowl, whisk together flour, cream of tartar, baking soda, cinnamon, nutmeg, and salt. In a large bowl, cream together butter, coconut oil, and sugars. Add eggs, vanilla extract and rum extract. Mix together sugar/spice mixture. Mix in dry ingredients until well incorporated. Make dough into walnut sized balls and roll in sugar/spice mixture and bake 350F for about 9-11 minutes. Whisk or sift dry ingredients in large bowl. Cream butter and sugars in medium bowl. Add coffee, eggs and vanilla extract. Mix wet ingredients into dry ingredients. Drop onto cookie sheet in walnut sized balls. Bake 350F 11-13 minutes. Whisk or sift dry ingredients in large bowl. Cream butter and sugars in medium bowl. Add vanilla extract and eggs. Mix wet ingredients into dry ingredients. Drop onto cookie sheet in walnut sized balls. Bake 350F 11-13 minutes. Preheat oven to 375F. Line baking sheets with parchment paper and set aside. In a large bowl, whisk together flour, cornstarch, baking powder, baking soda, and salt. 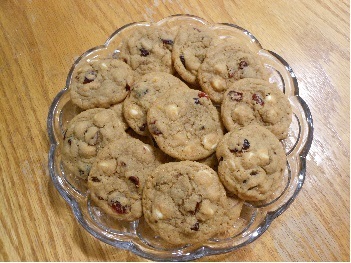 Mix in white chocolate chips and dried cranberries and set aside. In a large bowl, cream together butter and sugars. Add eggs, vanilla extract and orange zest. Mix in dry ingredients until well incorporated. Drop walnut-sized balls onto prepared baking sheets and bake 375F for about 9-11 minutes. Place currants or raisins in small pan. Cover with a little water and boil at medium low heat until the water is absorbed. Whisk or sift the next 8 ingredients in large bowl. Cream butter and sugars in medium bowl. Add vanilla extract and eggs. Mix wet ingredients into dry ingredients. Stir in oatmeal until well incorporated. Drop onto cookie sheet. Bake 350F 12-14 minutes. Leave on cookie sheet for about 3 minutes before moving to wire rack. 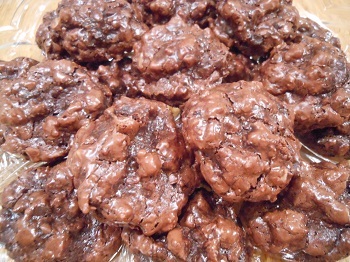 In small sauce pan, melt 2 c. chocolate chips and butter over medium-low heat, stirring until melted. Reduce heat to low and whisk in sugar until dissolved. Turn off heat and mix in vanilla. Set aside to cool slightly. In a large bowl, whisk together flour, baking powder, salt and remaining chocolate chips. Add eggs to slightly cooled chocolate mixture, mixing well. Mix wet ingredients into dry ingredients with a wooden spoon, until well incorporated. Cover and refrigerate at least 2 hours. Preheat oven to 350F. 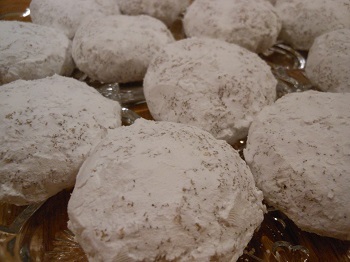 Shape dough into walnut-sized balls and roll in confectioners' sugar. Bake for 12-14 minutes on an ungreased baking sheet. Cool on baking sheet for at least 2 minutes before removing to wire racks. Arrange oven rack to the upper third of the oven. Preheat oven to 320F. Line a large baking sheet with parchment paper. Set aside. In a medium bowl, whisk together sugar, cocoa powder, and salt. Mix in walnuts and dried figs. In a small bowl, mix together egg white and vanilla extract. Add egg white to dry ingredients, mixing until dry ingredients are moistened. Spoon heaping teaspoons of batter onto prepared pan, making about 24 cookies. Bake 320F, 15-17 minutes, or until glossy and cracked in appearance. Carefully remove parchment paper with cookies from the pan to a wire rack. Cool completely before removing cookies from parchment with a spatula. Preheat oven to 325F. Line a large baking sheet with parchment paper. Set aside. In a medium bowl, mix together coconut, sugar, flour and salt. Add vanilla and almond extract to egg whites. Combine with dry ingredients. Drop coconut mixture by rounded tablespoons placing 2 inches apart on prepared baking sheet. Bake 325F for 20-25 minutes or until tips of coconut begin to brown. Remove parchment with cookies to wire rack. Cool completely. Melt chocolate chip. Mix in coconut oil. 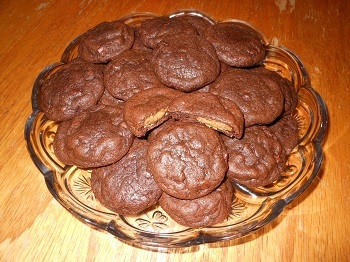 Dip bottoms of cookies in chocolate. Set back on parchment paper upside down until chocolate is set. 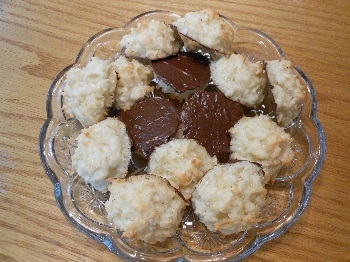 Store macaroons in an air-tight container. Preheat oven to 375F. In a large bowl whisk together dry ingredients. In a medium bowl beat together sugar and butter. Add eggs and mix well. Add red food coloring and mix until color is even. Divide batter into 48 balls. Place 12 balls each on cookie sheets lined with parchment paper. Bake a dozen at a time 375F about 8 minutes. Remove from oven and leave on pan for another 8 minutes before removing to wire racks to cool completely. 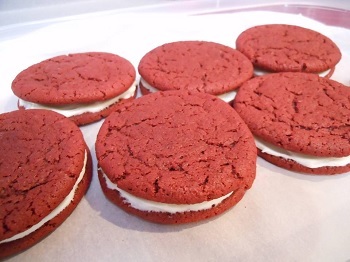 Once cookies are completely cooled, mix together ingredients for filling. Spread filling on 24 cookies and place the rest of the cookies on top to make two dozen sandwich cookies. 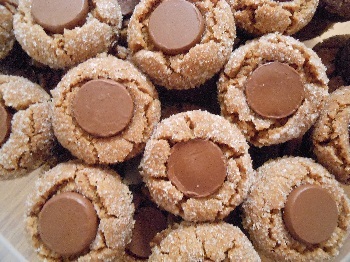 Store cookies in an airtight container in the refrigerator. In a small bowl, mix together ingredients for filling with a wooden spoon until smooth. Divide into 48 marble-sized balls and place on a foil-lined pan. Freeze for at least one hour. For dough, whisk together flour, cocoa powder, baking soda, and salt in a medium bowl. Mix in mini chocolate chips and set aside. In a large bowl, cream together butter and sugars. Add eggs and vanilla extract. Beat until smooth. Add dry ingredients and mix until well incorporated. If dough is too soft to handle, place in refrigerator for about a half hour. Preheat oven to 350F. Line baking sheets with parchment paper. Divide dough into 48 quarter-sized balls (about 2 tbs.). Flatten dough ball and place around frozen peanut butter ball. Seal the dough well so the peanut butter filling cannot be seen. 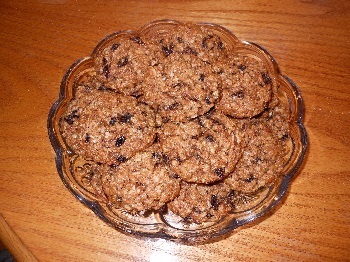 Place cookie balls on prepared pans and bake 350F for about 8 minutes. 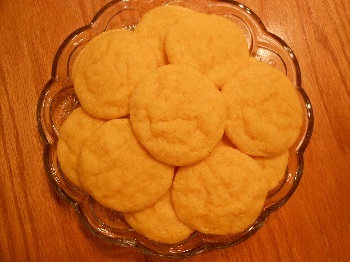 Leave cookies on pan at least 5-10 minutes after baking to allow cookies to set, before moving to wire racks to cool. Unwrap kisses and set aside. Preheat oven to 375F. In a large bowl mix together peanut butter, brown sugar and eggs. 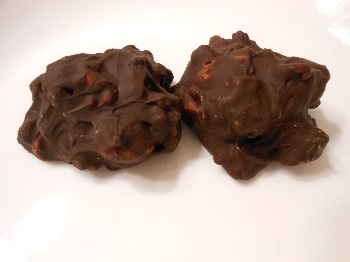 Rolls into walnut sized balls (about 23 grams by weight). Roll dough in sugar. Place dough balls in two ungreased mini muffin pans. Bake 375F 12-14 minutes. Immediate press a Hershey's Kiss upside down on each cookie. 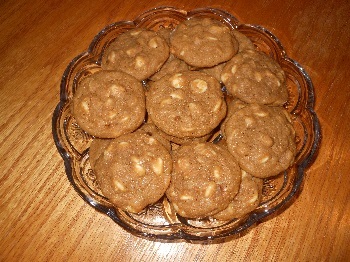 Allow to set in pan about 3-5 minutes before carefully removing cookies to a wire rack to cool. Unwrap kisses and set aside. Follow directions for snickerdoodle dough. Preheat oven to 375F. Rolls into walnut sized balls (about 23 grams by weight). Roll dough in cinnamon/sugar mixture. Place dough balls in two ungreased mini muffin pans. Bake 375F 12-14 minutes. Immediate press a Hershey's Kiss upside down on each cookie. 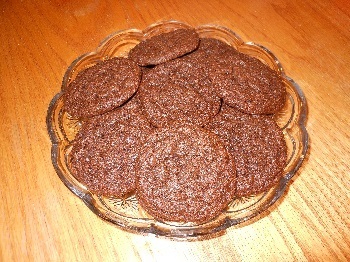 Allow to set in pan about 3-5 minutes before carefully removing cookies to a wire rack to cool. Preheat oven to 350F. Line a large baking sheet with parchment paper and grease. Set aside. In a medium bowl, mix together almonds, sugar and cinnamon. Mix in egg whites. Taking dough by heaping teaspoons, roll into about 24 balls. Place on prepared pan and bake 350F for 20-24 minutes. Remove parchment with cookies to wire rack. Cool for about 10 minutes. 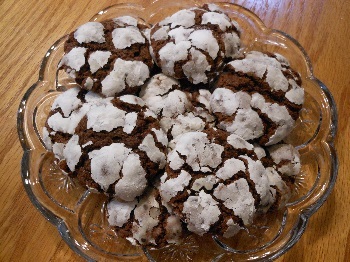 Dip warm cookies in confectioners' sugar to coat. Return to parchment to cool completely. Preheat oven to 320F. Line a large cookie sheet with parchment paper and set aside. In a medium bowl, mix together sugar, almond extract, and egg whites. 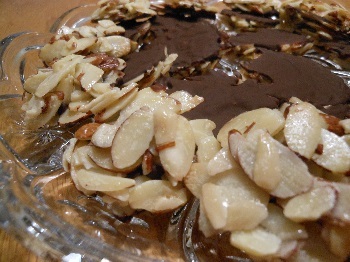 Add almonds and mix well. Drop by heaping teaspoons on prepared pan, spreading to make thin rounds about 2 inches in diameter. Bake 320F for 15-20 minutes, or until cookies begin to brown. Carefully remove parchment paper with cookies from the pan to a wire rack. Cool completely. When cooled, carefully peel off cookies from parchment when cooled. Melt chocolate in a small saucepan over medium-low heat. Mix in coconut oil. Spread a thin layer of chocolate on the bottom of each cookie. Lay upside down on parchment to allow chocolate to set. 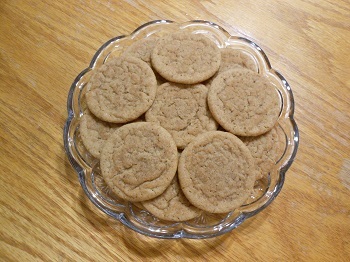 Store cookies in an air-tight container. Preheat oven to 200F. Line a large baking sheet with parchment paper. Set aside. In a small bowl, beat egg whites on low-medium speed until foamy. Add the cream of tartar. Beat on high until soft peaks form. Gradually add in sugar, beating on medium-high. Continue beating on high speed until very stiff peaks form, about 12-15 minutes. Beat in extracts and food coloring. 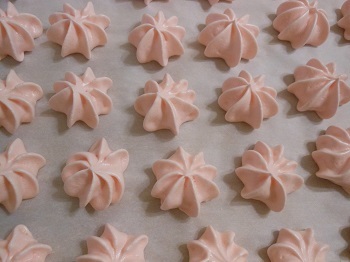 Carefully spoon meringue mixture into a pastry bag fitted with a 1/2 inch star top. Pipe onto prepared pan in 2-3 inch blossoms. Bake 200F for 1 1/2 hours, rotating pan at about 45 minutes. Turn oven off and leave the door open a crack for several hours, or overnight. (Tip: If your oven light stays on when open, use a ball of foil to push in the light lever to keep the light off and the oven cracked open). Write or print out Scripture verses that pertain to prophecy on strips of paper no more than 4 inches long and a half inch wide (see below for suggestions). Preheat oven to 400F. Generously butter three large baking sheets (preferable light colored metal). Set aside. In a small bowl, whisk together flour, sugar, and salt with a fork. Add egg white and extracts. Mix well with fork, until smooth. Divide batter into 9 mounds, 3 to a pan, about 4 inches apart. Using the back of a spoon, carefully spread batter into thin circles about 3 to 4 inches in diameter. Bake one pan at a time at 400F for 5-7 minutes, or until edges turn gold brown. When the first pan is done, carefully remove one cookie with a wide spatula, and turn upside down on a large plate. Place a strip of paper in the middle and fold over. Remove another cookie from the pan and turn upside down on the plate and place a strip of paper in the middle and fold over. Take the first cookie folded in half and carefully fold the ends down toward each other. Remove the last cookie on the pan and turn upside down on the plate and place a strip of paper in the middle and fold over. Take the second cookie folded in half and fold the ends down toward each other. Repeat with the last cookie folded over. Repeat steps with the last two pans of cookies. Place cookies in a mini muffin pan to maintain shape while cooling. Store cookies in a loosely covered container. Yield: 9 cookies. Note: Cookies best served the same day. They will turn slightly chewy overnight. To crispen up, place on a mini muffin tin in a warm oven until cookies become warm and flexible. Allow to cool completely before serving. Revelation 2:7 - To him who overcomes I will give to eat from the tree of life, which is in the midst of the Paradise of God. Revelation 2:11 - He who overcomes shall not be hurt by the second death. 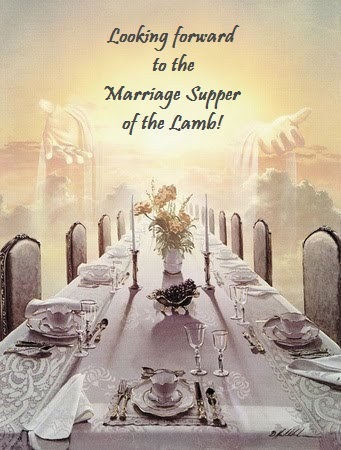 Revelation 2:17 - To him who overcomes I will give some of the hidden manna to eat. And I will give him a white stone, and on the stone a new name written which no one knows except him who receives it. Revelation 2:26-27 - And he who overcomes, and keeps My works until the end, to him I will give power over the nations - 'He shall rule them with a rod of iron; They shall be dashed to pieces like the potter's vessels' - as I also have received from My Father; and I will give him the morning star. Revelation 3:5 - He who overcomes shall be clothed in white garments, and I will not blot out his name from the Book of Life; but I will confess his name before My Father and before His angels. Revelation 3:12 - He who overcomes, I will make him a pillar in the temple of My God, and he shall go out no more. I will write on him the name of My God and the name of the city of My God, the New Jerusalem, which comes down out of heaven from My God. And I will write on him My new name. Revelation 3:21 - To him who overcomes I will grant to sit with Me on My throne, as I also overcame and sat down with My Father on His throne. Revelation 21:3-4 - And I heard a loud voice from heaven saying, "Behold, the tabernacle of God is with men, and He will dwell with them, and they shall be His people. God Himself will be with them and be their God." And God will wipe away every tear from their eyes; there shall be no more death, nor sorrow, nor crying. There shall be no more pain, for the former things have passed away. Revelation 21:6-7 - And He said to me, "It is done! I am the Alpha and the Omega, the Beginning and the End. I will give of the fountain of the water of life freely to him who thirsts." He who overcomes shall inherit all things, and I will be his God and he shall be My son. Preheat oven to 350F. Mix together 2 tbs. sugar and 1/2 tsp. cinnamon in a small bowl. Grease 9x13-inch cake pan and dust with cinnamon/sugar mixture. Set aside. In a medium bowl, whisk together flour, baking cocoa, baking soda, salt and spices. In a large bowl, cream butter and sugar. Add eggs, one at a time, beating well. Alternately add dry ingredients and applesauce to wet ingredients, beginning and ending with the dry ingredients. Pour into prepared pan. Sprinkle with chocolate chips and pecans. Bake 350F for 35-40 minutes, or until toothpick inserted near the center of the cake comes out clean. 1/2 c. milk minus 1/2 tbs. Preheat oven to 350F. In a 2-cup measuring glass, combine milk and apple cider vinegar to make 1/2 cup liquid. Set aside and allow to curdle. 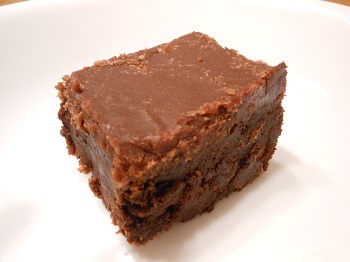 Grease a 9x13-inch baking pan and coat with the 2tbs sugar/baking cocoa mixture. Set aside. In a medium bowl, whisk together flour, baking cocoa, and baking soda. Set aside. Add 1 c. Coca-cola to curdled milk. Set aside. In a large bowl, cream butter and sugar. Add eggs and 2 tsp. vanilla extract. Mix until combined. Alternately add dry ingredients and wet ingredients to creamed mixture, beginning and ending with the dry ingredients. Fold in marshmallows. Pour into prepared pan. Bake 350F 40-45 minutes, or until toothpick inserted near the center of the cake comes out clean. When the cake is done, melt butter in a medium saucepan. Add baking cocoa and stir until smooth. Add 1/3 c. Coca-cola and 1 tbs. vanilla extract. Bring to a boil. Turn down heat. Whisk in sugar and continue to stir and cook until smooth. Pour over warm cake. Allow frosting to set up and cool before cutting cake. Preheat oven to 350F. Mix together 2 tbs. sugar and 1/2 tsp. cinnamon in a small bowl. Grease 10x15-inch cake pan and dust with cinnamon/sugar mixture. Set aside. 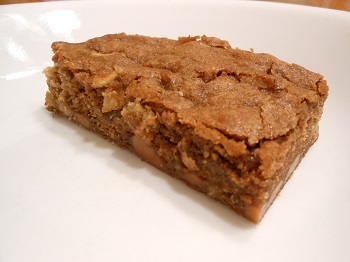 In a medium bowl, whisk together flour, baking powder, baking soda, cinnamon, cloves, ginger, nutmeg, and salt. In a large bowl, whisk together pumpkin, eggs, sugars, oil and applesauce. Combine dry ingredients with wet ingredients. Mix well. Pour into prepared pan. Bake 350F for 25-30 minutes, or until toothpick inserted near center comes out clean. Cool cake completely before frosting. Beat together icing ingredients in medium bowl. Spread over cooled cake. Store in refrigerator. Preheat oven to 325F. Mix together 2 tbs. sugar and 1/2 tsp. cinnamon in a small bowl. Grease a standard Bundt or tube cake pan and dust with cinnamon/sugar mixture. Set aside. In a medium mixing bowl, whisk together the flour, baking soda, baking powder, salt and the spices. Set aside. In a large mixing bowl, whisk together the brown sugar and eggs. Add the vanilla, honey, vegetable oil, and applesauce. Mix well. Gradually add the dry ingredients to the wet ingredients. Mix well. Pour batter into prepared pan and bake 325F for 55-65 minutes, or until a toothpick inserted near the center comes out clean. Cool completely before removing from pan to a cake platter. 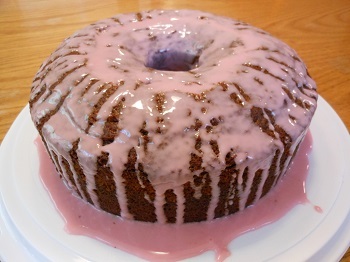 To make glaze, whisk together pomegranate juice and confectioners' sugar until smooth. Drizzle over cooled cake. Allow glaze to set before serving. Excellent served with pomegranate frozen kefir or Greek Frozen Yogurt. Preheat oven to 350F. Grease and flour a Bundt cake pan and set aside. In a large mixing bowl, cream butter and sugar together. Add ricotta cheese and beat on medium speed for 5 minutes, scraping bowl a few times. Add eggs one at a time. Add vanilla, zest and lemon juice and mix well. In a medium bowl, whisk together flour, baking powder, baking soda, and salt. Fold in half of flour mixture to wet ingredients. Add remaining flour mixture and fold in until ingredients are just combined. Pour batter into prepared pan and bake 350F for 35-40 minutes, or until toothpick comes out clean. When cake is done, leave in pan while making glaze. 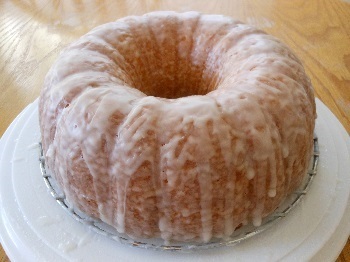 For glaze whisk together confectioners' sugar and enough lemon juice to make a thin enough glaze to drizzle over cake. 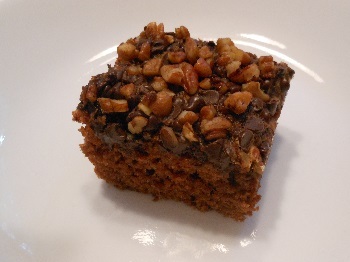 Turn cake onto a wire rack and place rack on a plate. Drizzle glaze over cake, carefully turning to coat entire cake. Scrape glaze that fell onto plate back into bowl and drizzle over cake, repeating until most of the glaze covers the cake. Cool completely before moving cake from wire rack to a serving plate. 1 tbs. key lime juice + Enough milk to make 1 c.
Preheat oven to 350F. Grease and flour two 9-inch round cake pans and set aside. For the cake, whisk together flour, baking powder, and salt in medium bowl. Combine key lime juice and milk; set aside and allow to curdle. 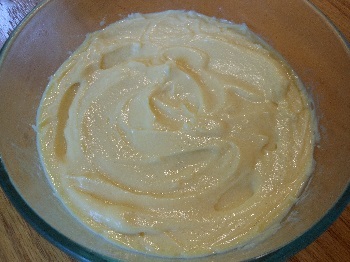 In a large bowl, cream together butter and sugar, mixing for about 3 minutes. Add eggs, one at a time. On low speed, mix in zest and a fourth of the flour mixture. Add a third of the curdled milk, then a fourth of the flour mixture. Repeat two more times, mixing until just combined. Divide batter between prepared pans. Bake 350F 25-30 minutes, or until toothpick near the middle comes out clean. Leave in pan for about 10 minutes before removing to wire racks to cool completely. For the filling, whisk together sugar, cornstarch, key lime juice, zest, and egg yolks. Cook and stir continuously over medium heat. Continue to cook and stir until mixture begins to boil. Continue stirring for another minute, or until mixture begins to thicken. Remove from heat and whisk in butter until melted. Pour filling into a glass dish and place plastic wrap on the surface. Refrigerate for at least two hours before assembling the cake. For the frosting, beat together all the frosting ingredients until light and fluffy. 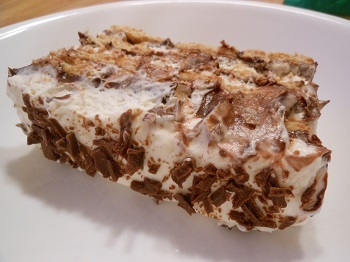 To assemble the cake, carefully cut the two layers in half horizontally to make four layers. Placing several toothpicks around the layers can help guide when cutting. On a serving plate, place the first layer, cut-side up and spread with half the filling. 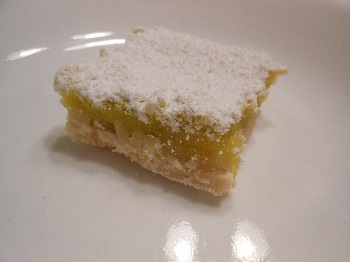 Place the second layer, cut-side down on top of the filling. Spread the top of the second layer with a thin layer of frosting. 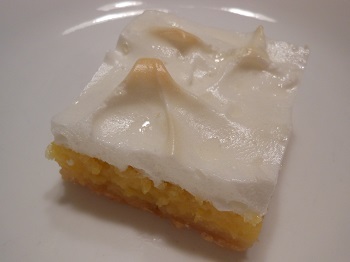 Place a third layer, cut-side up, on top of the frosted layer. Spread the remaining filling on top of the third layer. Place the last layer, cut-side down on top of the filling. 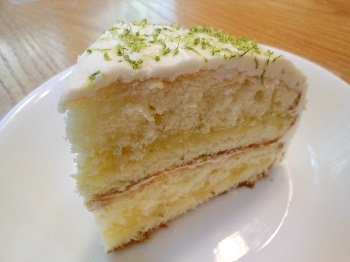 Frost the cake and sprinkle top with more lime zest, if desired. Store cake in refrigerator. Place egg whites in mixing bowl for 30 minutes. In another bowl, mix together confectioners' sugar and flour with whisk. Set aside. Preheat oven to 350F. To the egg whites, add cream of tartar, salt, vanilla and almond extract. Beat egg white mixture on high speed. Gradually add sugar and beat until stiff peaks form. 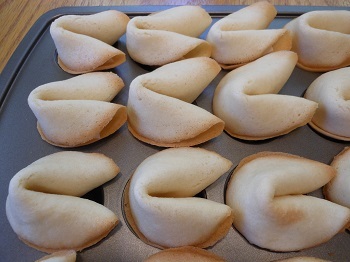 Gradually fold in flour mixture, about 1/4 cup at a time. Spoon batter into an ungreased 10-inch tube pan. Cut through batter with a knife. Bake at 350F for 40-45 minutes. Invert pan on wire rack and cool completely before removing cake from pan. 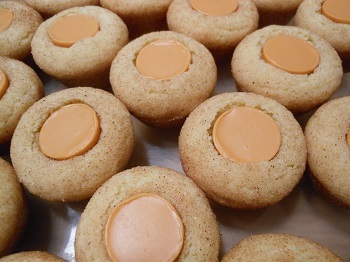 About a half hour before you are ready to make the cupcakes cut butter into pea-sized pieces and leave out at room temperature. When you are ready, preheat oven to 325F. In a large bowl, whisk or sift together sugar, flours, baking powder and salt. Add butter and use a butter knife or pastry cutter to break apart and coat butter pieces with flour mixture. In a small bowl, combine eggs, milk, and vanilla extract. Add a third of the wet ingredients to the flour mixture. Beat on low speed, pulsing if needed until it begins to come together. Add another third of the wet ingredients and beat on medium speed. Scrape bowl and add remaining third of the wet ingredients. Beat on medium speed until well combine, scraping once. Do not over mix. Stack two muffin tins together or place muffin tin on a metal baking sheet to help prevent bottom of cupakes from getting too dark. Line tin with paper or foil liners. Fill muffin cups about half full. Bake 325F 25-30 minutes, or just until the cupcakes begin to turn a light golden brown, or a toothpick inserted in the middle comes out clean. 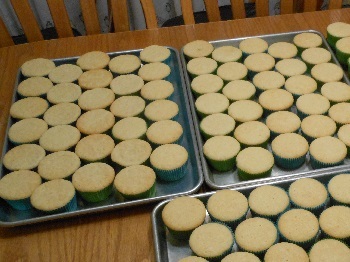 Recipe makes about 36 cupcakes (3 dozen). Frost cupcakes when they are completely cool. Click here for frosting ideas. Preheat oven to 350F. In a small bowl, mix together milk and vinegar; set aside and allow to curdle. In a large bowl, whisk or sift together flour, sugar, cocoa powder, baking soda, baking powder and salt. Add all the wet ingredients. Beat batter on low speed for about 3 minutes, scraping bowl occasionally. Stack two muffin tins together or place muffin tin on a metal baking sheet. Line tin with paper or foil liners. Fill muffin cups about half full. Bake 350F 20-25 minutes, or until a toothpick inserted in the middle comes out clean. 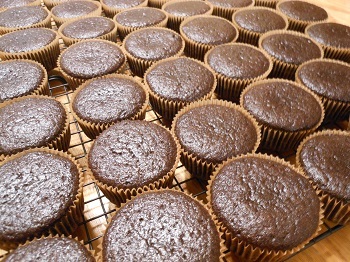 Recipe makes about 24 cupcakes (2 dozen). Frost cupcakes when they are completely cool. Click here for frosting ideas. Beat together all ingredients, adding enough milk or water to make desired consistency. This is enough frosting for about 3 dozen cupcakes. 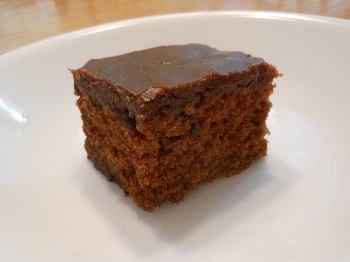 To make chocolate frosting, add 1 1/3 c. unsweetened baking cocoa to the basic frosting recipe. Add another cup or two of confectioners' sugar if frosting is too bitter for your taste. Add additional milk or water to reach desired consistency. Wrap foil tightly around outside of 9-inch spring-form pan. In a bowl, combine crumbs and butter; blend well. Press into the bottom and about 2 inches up the sides of the spring-form pan. Bake at 350F for 8-10 minutes or until set. Cool on a wire rack. Keep foil on pan. To prepare oven for cheesecake, place one rack low with a large pan or casserole dish (10x15" would be best), filled with water. Place other rack at the normal, half-way position. Turn oven on to 300F to preheat. Allow all ingredients to come to room temperature. In large bowl, combine cream cheese and sugar at medium-low speed, scraping the sides of the bowl often. Add all other ingredients except eggs. When completely mixed, with no lumps, add the eggs and egg yolk, one at a time, beating on low. Do not over-mix, or the cheesecake will crack. Pour batter in cooled crust. To remove any bubbles, carefully lift pan an inch or two off the counter or table and allow it to drop straight down. Repeat several times; turning the pan with each drop. Place cheesecake in oven on rack over the water bath. If you want a pale cheese cake, rather than a browned cheesecake, place foil loosely over the top. Bake at 300F for 1 hour. Reduce heat to 200F and bake for 1 hour longer. 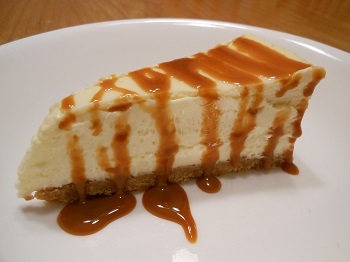 Turn oven off and leave cheesecake in oven until completely cool, or overnight up to 8 hours. Do not open oven door at all during the baking or cooling process. Cooling too quickly will cause cracks. After removing the cheesecake from the oven, run a knife around the edge of the cheesecake to separate it from the sides of the pan. 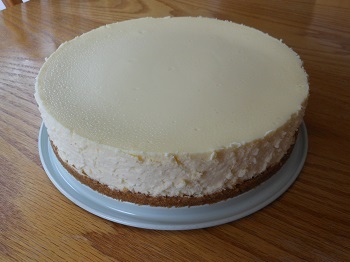 Cover cheesecake and refrigerate completely before removing cheesecake from pan. To remove cheesecake, open spring-form pan and run a piece of unflavored dental floss underneath to lossen from the bottom of the pan. To cut slices perfect slices, use unflavored dental floss instead of a knife. Serve with your favorite topping. I like dulce de leche, shown in the picture to the left. Preheat oven to 350F. In a small bowl, mix together ingredients for pie crust. Before adding butter, mix in 1/2 tsp. cinnamon. Press crust into an ungreased 9x9-inch baking dish. Set aside. In a large bowl, beat together cream cheese, sugar, and salt. Add in eggs one at a time, beating on low speed until smooth, scraping bowl a few times. In a medium bowl add apple pie filling. Use a knife to cut apple wedges into bite-sized pieces. Add 1/2 tsp. cinnamon to pie filling. Fold pie filling into cream cheese mixture. Pour mixture into prepared crust. Bake 350F 45-50 minutes. Cool for a few hours on wire rack. Heat caramel sauce and spread over bars. Refrigerate for several hours before serving. Preheat oven to 350F. Butter 12x18x1-inch pan. Set aside. In a medium bowl whisk together dry ingredients for brownies. 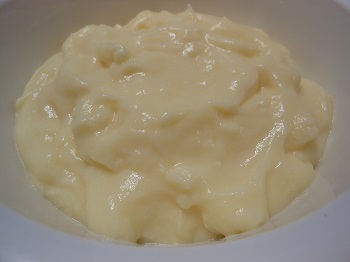 In a large bowl whisk together melted butter, sugar, vanilla and eggs. Add dry ingredients. Mix well. Bake 350F 28-32 minutes. Do not over bake. About 10 minutes before brownies are done, make icing. Melt 6 tbs. butter in a medium saucepan. Add milk and cocoa powder. Bring to a boil, stirring constantly. Reduce heat to low. Add vanilla. Stir in confectioners' sugar. Cook and stir until sugar is completely dissolved. Spread over hot brownies. Sprinkle with pecans, if desired. Cool completely before cutting. In a medium sauce pan melt butter. Remove from heat. Add cocoa powder and sugar. Mix well. Add vanilla and salt. In a large mixing bowl beat eggs. Stirring constantly with a whisk, gradually add chocolate mixture to eggs. Fold in flour and chocolate chips until just smooth; do not over mix. Pour batter into a greased 9x13-inch baking pan. Bake 350F for 30-35 minutes. Spread Nutella over warm brownies. Sprinkle with pecans, if desired. Preheat oven to 350F. Grease 9x13-inch baking dish. Dust with a little cocoa powder and/or sugar, if desired. Set aside. In a medium saucepan, melt butter. Add cocoa powder and sugar. Mix until smooth. Remove from heat. In a large bowl combine chocolate mixture, eggs and vanilla extract. Bake 350F 45-55 minutes. Sprinkle chocolate chips over hot brownies and spread evenly as they melt. Preheat oven to 350F. Grease 9x13-inch baking dish. Dust with a little cocoa powder. Set aside. In a medium bowl, beat cream cheese with 1/4 c. sugar, until smooth. Beat in heavy cream, sour cream and vanilla extract, and then beat in 2 eggs. Set aside. In a large sauce pan, melt chocolate chips and butter over medium-low heat. Turn off heat and mix in sugar and coffee granules until smooth. Quickly whisk in the beaten eggs and mix well. Finally, mix in cake flour until well incorporated. Pour about half the brownie batter into prepared pan. Slowly pour cheesecake batter over brownie batter evenly. Slowly pour the rest of the brownie batter over the cheese cake. The brownie batter will not completely cover the cheesecake but look swirled. Bake 350F 45-50 minutes or until center is almost set and brownies begin to pull away from the pan. Cool on a wire rack and then dust the top with cocoa powder. Store in refrigerator. In a medium sauce pan melt butter. Remove from heat. Add cocoa powder and sugar. Mix well. Add extracts and salt. In a large mixing bowl beat eggs. Stirring constantly with a whisk, gradually add chocolate mixture to eggs. Fold in flour, cherries, and chocolate chips until just smooth; do not over mix. Pour batter into a greased 9x13-inch baking pan. Bake 350F for 35-40 minutes. When the brownies are done, melt butter in a medium saucepan. Add baking cocoa and stir until smooth. Add Coca-cola and extracts. Bring to a boil. Turn down heat. Whisk in sugar and continue to stir and cook until smooth. Pour over warm brownies. 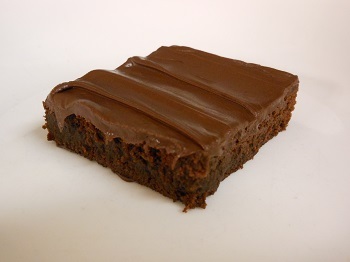 Allow frosting to set up and cool before cutting brownies. Preheat oven to 350F. Grease a 9x9 inch baking dish with butter. Zest and juice lemons and set aside in separate containers. In a medium bowl, whisk together 2 tbs. 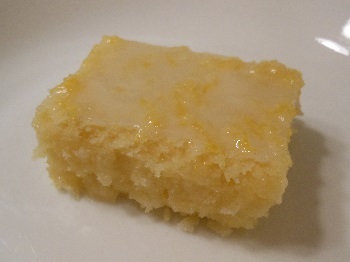 lemon zest, 2 tbs. lemon juice, and 2 eggs. Set aside. In a large bowl, beat together butter, sugar, and flour. Mix in lemon mixture. Beat on medium speed for about 2 minutes. Pour into prepared pan and bake about 25 minutes, or until edges just begin to brown. Middle will be pale. Cool completely. To make glaze, in a small bowl, whisk together confectioners' sugar, 1/4 c. lemon juice, and 2 tbs. lemon zest. Spread about half the mixture on cooled brownies. Let set about 10-15 minutes then spread the remaining mixture over the brownies. Allow to completely set before cutting brownies. Preheat over to 375F. Wisk or sift dry ingredients in large bowl. Cream butter and sugars in medium bowl. Add vanilla extract and eggs. Mix wet ingredients into dry ingredients. Spread into a greased 15x10-inch pan. Bake 375F for about 20 minutes. Let cool for at least a half hour before cutting into bars. Preheat oven to 350F. In a small bowl, mix together ginger snap crumbs and melted butter. 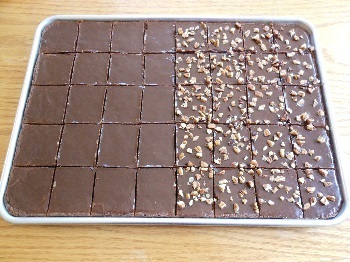 Press mixture evenly in a 13x9-inch baking dish. Set aside. For the filling, in a large bowl, mix together 1/2 c. brown sugar, pumpkin pie spice, and salt. Use your fingers to mix out any lumps in the brown sugar. 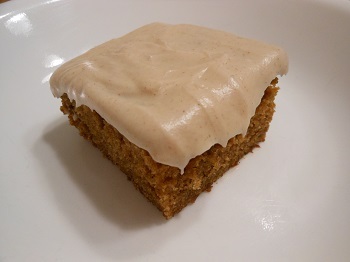 Whisk in 2 eggs, then whisk in the pumpkin puree, and finally whisk in the evaporated milk, until smooth. Pour onto prepared crust. 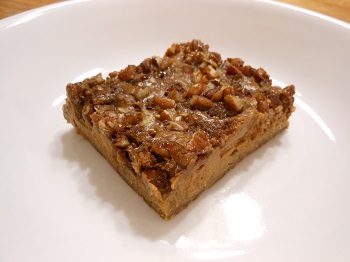 For the pecan topping, in a small bowl, mix together pecans, 1/3 c. brown sugar, and cinnamon, then mix in melted butter. Spoon mixture evenly over pumpkin filling. Bake for 30-35 minutes, or until knife inserted near the center comes out clean. Preheat oven to 350F. In a medium bowl mix together butter, brown sugar, vanilla extract, and eggs. In a large bowl, whisk together flour, cinnamon, baking soda, and salt. 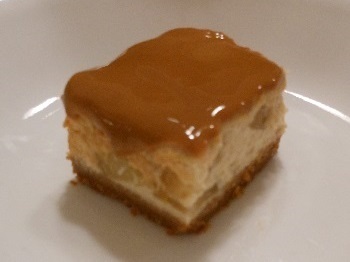 Stir in butter mixture and then fold in chopped apple and caramel bits. Spread into a greased 9x13-inch baking dish. Bake 350F 25-30, or until toothpick inserted near the center comes out clean. Preheat oven to 350F. Begin the meringue by boiling 2/3 c. water in small pan. In a small bowl, mix cornstarch and cold water. Add to boiling water. Cook and stir until clear. Set aside and cool completely. To make the crust, combine flour, sugar and lemon zest and butter in a medium mixing bowl. Use pastry cutter to mix until mixture resembles coarse crumbs. 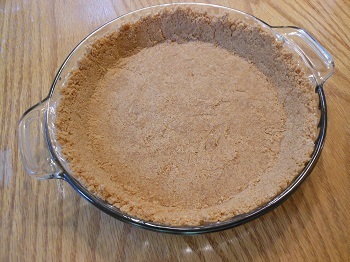 Pat into a greased 13x9-inch baking dish. Bake 350F for 20 minutes. Meanwhile, combine all the ingredients for the filling in a large bowl. Whisk together until smooth. When crust is done, pour filling into hot crust and return to oven. Bake for about 20 minutes, until filling is set. The edges will lightly brown. While the bars are baking, finish the meringue. In a large mixing bowl, beat egg whites to soft peaks, adding the sugar and salt in gradually when egg whites become foamy. Gradually add cooled cornstarch mixture. Mix well. Spread over hot, cooked filling and return pan to oven. Bake for about 8-10 minutes, until lightly browned at the peaks. Turn off oven. Open oven door slightly and leave in oven for about 30 minutes. Chill bars before cutting into bars. Use a slightly damp knife to make a clean cut through the meringue. In a medium bowl, combine 2 cups of flour and 1/2 cup confectioners' sugar, and butter. Use pastry cutter to mix until mixture resembles coarse crumbs. 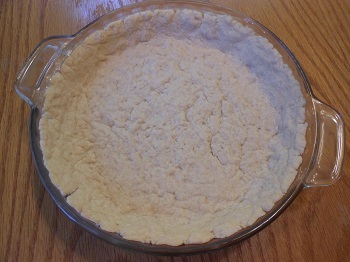 Pat into a greased 13x9-inch baking dish. Bake 350F for 20 minutes. In a large bowl, whisk together the eggs, sugar, lime juice, food coloring, lime peel, 1/2 cup flour, and baking powder. Pour over hot crust and bake 350F for 20-25 minutes, until golden brown. Cool on wire rack. Use a sifter or strainer to dust remaining confectioners' sugar over cooled bars. Preheat oven to 375F. In a medium bowl, combine flour, sugar, and salt. Cut in butter until it looks like crumbs. Press half of crumb mixture into a 9x9-inch baking dish. Bake 375F for 10 minutes. In a large saucepan, add zucchini, raisins, and lemon juice. Bring to a boil. Reduce heat, cover and simmer for about 5 minutes, or until zucchini is tender. Drain off liquid. Stir in sugar, cinnamon, nutmeg and 1/4 c. crumb mixture. 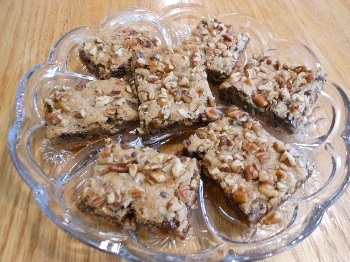 Stir in pecans and raisins. Pour over crust. Sprinkle with remaining crumb mixture. Bake 375F 25-30 minutes. Let stand for at least 10 minutes before cutting into squares. Store in refrigerator. Mix ingredients together to form a dough. Pat into 9-inch pie plate. Bake 425F for 10 minutes. Combine ingredients in small bowl. Press into bottom and up sides of a 9-inch pie plate. Refrigerate for at least a half hour or bake 375F for 8-10 minutes and cool before using. Preheat oven to 375F. In a large bowl, whisk together pumpkin, sugar, pumpkin pie spice, nutmeg and salt. Whisk in vanilla and eggs. Mix well and then whisk in milk. Pour into prepared crust. Bake 375F for 60-65 minutes, or until knife inserted near center comes out clean. Cool on wire rack before refrigerating. Preheat oven to 375F. In a large bowl, place peaches. In a small bowl, mix together 6tbs. sugar, cornstarch, and 1/2 tsp. cinnamon. Pour over peaches and mix to coat. Set aside. In a medium bowl, cream together butter and 3/4 cup sugar. Beat in eggs and vanilla extract. In a small bowl mix together flour, baking powder, 1/4 tsp. cinnamon and salt. Fold into butter mixture until just combined. Pour peaches into a 9x13-inch pan. 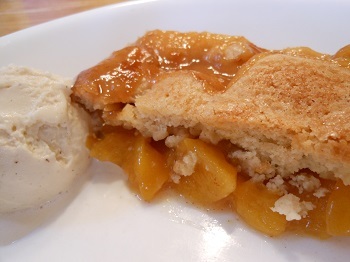 Drop cobbler batter by spoonfuls over peaches. Bake 375F for 55-60 minutes, or until golden brown. In a medium saucepan, mix together sugars, cornstarch, salt, egg yolks and milk. Stirring constantly, bring mixture to a boil over medium heat until it begins to thicken. Remove from heat and add butter and extracts. 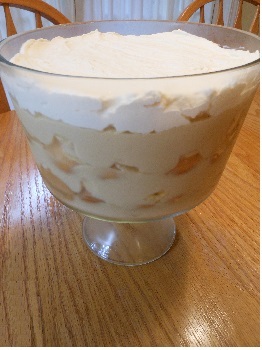 Spread a third of the pudding in a 13x9-inch dish or trifle bowl. Top with half the vanilla wafers and half the bananas. Spread another third of the pudding and top with remaining vanilla wafers and bananas. Spread the rest of the pudding on top. Cover the top of the pudding directly with plastic wrap to prevent a skin from forming. Refrigerate at least 4-6 hours. In a medium bowl, beat the whipped cream and confectioners' sugar on medium high, until stiff peaks form. Spread over chilled pudding before serving. 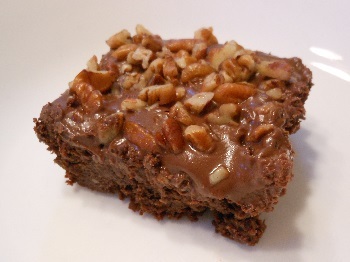 In a medium sauce pan, mix together cocoa powder, sugar, cornstarch, and milk. Stirring constantly, bring mixture to a boil over medium heat until it begins to thicken. Remove from heat and add vanilla extract and butter. Cover and chill for about 3-4 hours. In a medium bowl, mix cream cheese, confectioners' sugar, and almond extract. Set aside. In another medium bowl, beat heavy cream until almost stiff. Combine with cream cheese mixture and mix on low speed until just incorporated. Set aside. 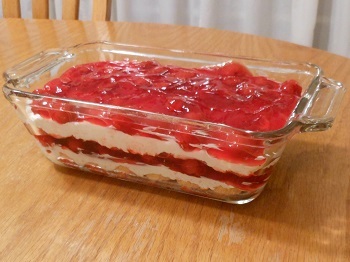 In a 2-quart dish, or 2-9x5-inch dishes layer half the ladyfingers and brush with half the maraschino cherry juice. Top with half of the cream mixture and half the cherry pie filling. Layer remaining ladyfingers and brush with the rest of the cherry juice. Top with remaining cream mixture and cherry pie filling. Dish will be very full if using a 2-quart dish. 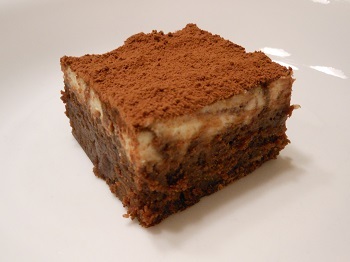 To cover before refrigerating, tent a piece of aluminum foil and crimp the edges around the dish so it does not touch the tiramisu. In a trifle bowl or a 9x13-inch glass dish, layer one-third of the crushed graham crackers and set aside. In a medium bowl, beat heavy cream until almost stiff. Add sifted cornstarch and beat until stiff peaks form. 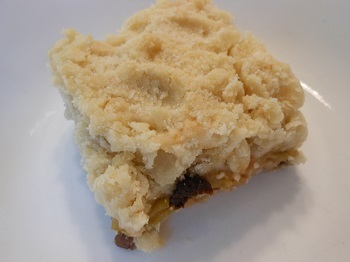 Gently fold in sweetened condensed milk until smooth. Set aside. Layer sliced mangos on graham crackers. Spread a third of the cream mixture over the top. Sprinkle with half of the remaining crushed graham crackers. Slice bananas and layer on top of graham crackers. Spread with half of the remaining cream mixture and the rest of the crushed graham crackers then spread the rest of the cream mixture over the graham crackers. Cover and chill for several hours or overnight. 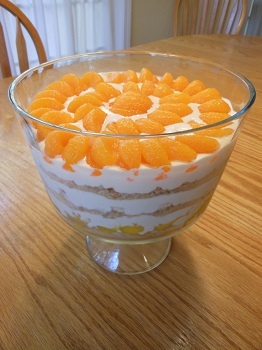 Before serving, arrange mandarin oranges on top of dessert. In a large bowl beat the whipping cream, gradually adding confectioners' sugar. Beat until cream is stiff. Set aside. 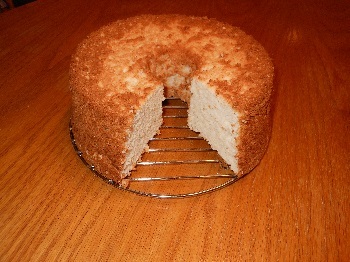 Cut half of an angel food cake into 2-inch chunks. Use remaining cake for something else. 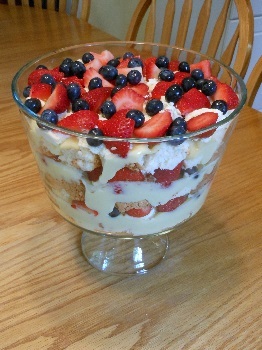 In a trifle bowl, layer one-third cake chunks, one-third custard, one-third whipped cream, one-third of each of the berries. Repeat layers twice more. Cover and refrigerate at least one hour before serving. In a medium saucepan, mix together sugar, cornstarch, milk, heavy cream, and eggs. Stirring constantly, bring mixture to a boil over medium heat until it begins to thicken. Remove from heat and stir in butter and vanilla extract. Pour into a bowl and place plastic wrap on the surface of the custard to prevent a skin from forming while chilling. Chill several hours before serving. In a medium bowl, whisk together sugar and cornstarch. In a medium saucepan whisk together milk and eggs. Add sugar/cornstarch mixture. Cook and stir constantly over medium heat until it begins to thicken. 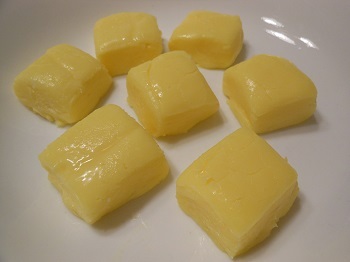 Remove from heat and mix in lemon juice, butter, and extract until smooth. Use a stick blender or a strainer to smooth out any lumps that may have formed from the lemon juice curdling the milk. Pour pudding into a glass container and place plastic wrap on the surface to prevent a skin from forming while chilling. Chill several hours before serving. Left over pudding may separate. Just mix and stir to serve. Line two large baking sheets with parchment paper. Set aside. In a large saucepan, melt caramels with water over medium-low heat, stirring until smooth. Stir in pecans and rice krispies. Using two well greased spoons, drop by heaping teaspoons onto prepared pans, forming mounds. Refrigerate until firm, about a half hour. In a medium saucepan, melt chocolate chips with coconut oil, stirring until smooth. Dip caramel mounds in chocolate to coat all side. Scrape off excess chocolate. Return to pan. Refrigerate until firm, about an hour. Goodies are best stored in an airtight container in the refrigerator or freezer. Line an 11x7-inch pan with foil. Grease with butter and set aside. In a large saucepan, melt butter. Mix in pudding mix and milk. Cook and stir over medium heat until thickened. Remove from heat. In a large bowl combine pudding mixture, confectioners' sugar and lemon extract. Use beaters to mix well. Pour into prepared pan. Freeze for several hours before serving. Carefully lift out foil from pan. 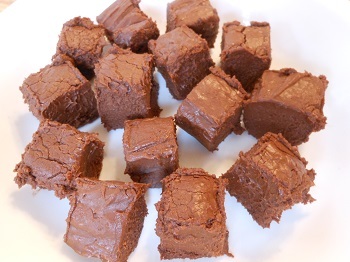 Cut fudge into squares with a butter knife. Store fudge in the freezer. Line a 9x9-inch pan with foil. Grease with butter and set aside. Mash beans in a food processor or with a stick blender. Mix in butter and vanilla until smooth. In a large bowl, sift together baking cocoa and confectioners' sugar. Stir in bean mixture and mix until smooth. Pour into prepared pan. Refrigerate for at least 2 hours before serving. Cut into squares. Store fudge in the refrigerator. Sprinkle gelatin over 2 cups cold water to soften. Add drink mix and sugar to boiling water. Add gelatin mix. Mix well. Pour into desired dish and chill to set. 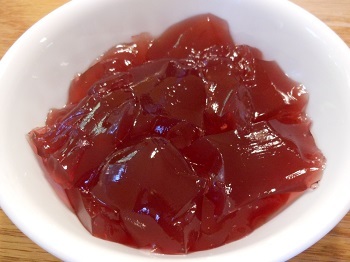 Sprinkle gelatin over 1 cup of juice in a medium bowl. Heat the remaining three cups of juice to a boil. Add to gelatin mixture and stir until dissolved. Pour into desired dish and chill to set.